Whitenair offers high qualityÂ Garment CabinetsÂ which are designed in order to provide ultimate solutions for garments storage needs. Our Sterile Garment Cabinets maintains the cleanliness of the controlled clean room environment by preserving the garments clean/sterile to use in a Clean room. 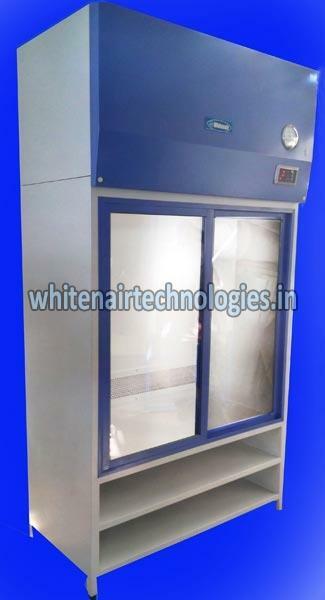 Whitenair garment storage cabinets are available in following configurations. All the models are fabricated of stainless steel or EPCGI sheet metal are available with Over head HEPA Filter that shower particle free air to dislodge and wash away contaminants. Equipped with a blower and a HEPA filter Module maintain vertical flow of particle free Air to prevent dust build up. Multiple configuration hanging Rods shelves or combination road & Shelves. Available in Close loop air Flow system or Single Pass system.